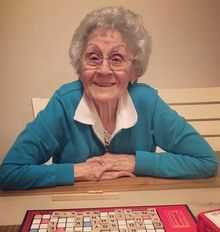 Eleanor B Janicek nee Bohac, 94, went home to be with her Lord and Savior on February 19, 2019 after a long and fruitful life. Preceded in death by her husband Valentine, son Anthony, daughter Carol, and brothers; Bill and Raymond. Survived by her children Monica Schnitz (Jim), Valentine (Diane), daughter-in-law Pamela, Ronald (Linda), Marla Benik (Mike), Julie Arnold (Jamie) and Joseph (Deb). Grandmother to 30 grandchildren, Great Grandmother to 33 great grandchildren and Aunt to many nieces and nephews. Ellie was known for her kindness & generosity. In the midst of raising seven children, she fostered a young woman along with hosting two foreign exchange students. She also opened her home to feed the homeless. Her home was always open to all in need. Ellie loved cooking for her family, dining out, reading, playing Scrabble, her weekly hair appointments and shopping for herself as well as her grandchildren and great grandchildren. She was an active member of every Catholic Church she belonged to. She served her fellow parishioners through delivering the Eucharist, teaching CCD, visiting the sick and serving on bereavement committees. She was warm, kind, loving, faithful and giving. She will be fondly remembered and dearly missed. In lieu of flowers, Memorial contributions may be made to Apple Leaf Assisted Living Home at 1328 N. 1st St, Berthoud, CO 80513. Friends and family may call at the Busch Funeral Home at 163 Avon-Belden Rd, Avon Lake, OH 44012 from 4-8 PM on Thursday February 28. Funeral Mass at St. Joseph's Catholic Church, 32946 Electric Blvd, Avon Lake, OH 44012 on Friday, March 1, 2019 at 10:00 AM. She will be laid to rest at Holy Trinity Cemetery, Avon, OH following the mass. There will then be a luncheon for family at St Joseph's Catholic Church in Avon Lake, OH. Prayers and loving thoughts to all of you and your families. She was a beautiful and loving lady with a family that has followed her footsteps. She always gave her best, her kindness flowed to everyone. Prayers hugs and love to you. There is a special spot in my heart for her and all of you. Prayers and Blessings to the family. Aunt Ellie was a very special lady who will always hold a special place in our hearts. Our deepest condolences. George (son of Joseph Janicek of Smithtown NY) and I truly enjoyed meeting Eleanor at the Cleveland and Colorado Janicek reunions. We thought she made a splendid family matriarch. I am truly sorry for your loss. I lost George this past November 18, 2018. They likely have joined all the other wonderful Janiceks who have gone before us. We have a wonderful group of guardian angels there! Stephanie Janicek, wife of nephew George. The memory I have of Aunt Eleanor was a person of love for all,empathy for all,and an independent spirit which was an example for all. I will miss her , love her , and continue to smile when I think of her. And to know I was so lucky to have her in my life. Special mightiness - psalm 90:10, to have lived a long and a good life is truly a blessing to the family and loved ones, may the loving God of all comfort and a promise hope, be with the family. Joe, Deb and Family- Deepest sympathy on the loss of your mother, and grandmother. I never met her, that I can recall, but she raised a very nice fellow in Joe. Prayers to you All.